When people move faster than NGOs. Heart-wrenching photos of drowned Alan Kurdi helped mobilise grassroots support for refugees, often through crowdfunding. The #BuyPens campaign raised over $180K on Indiegogo to support a Syrian refugee father. Others offered housing, brought supplies to refugees or organised transit convoys. Again, we’re reminded how technology and connectivity are allowing people to move faster than NGOs (and governments) in times of crisis. Still, mobilising money and logistics without top-down support can be daunting for those involved. Justine Corrie recounts the overwhelming amount of volunteers and donations her Facebook aid group raised and Issie Lapowski’s Wired article touches on the challenges of distributing money directly to refugees when your crowdfunding targets have been largely surpassed. What do the strongest “Open” campaigns look like? Colin Holtz, an experienced campaigner and strategist, shares key takeaways from Open Campaigns Camp, including a focus on local actions, even in global campaigns, and a deep need for more meaningful metrics. 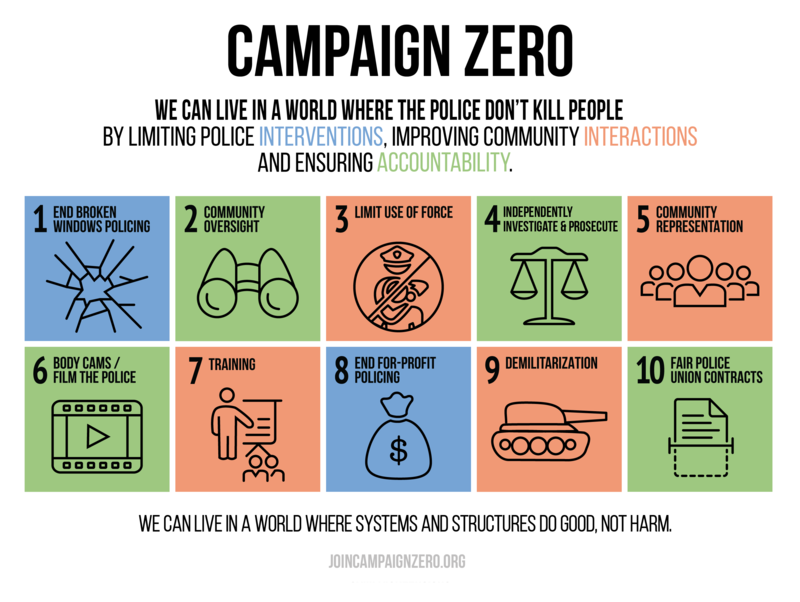 Campaign Zero + 10 points = A path to ending police violence. A group of key #BlackLivesMatter organizers launched Campaign Zero with a 10 point policy plan for ending the systemic police violence. The site also breaks out federal, state and local policy changes and gives American voters a detailed tracking tool comparing presidential candidate platforms with Campaign Zero’s proposed reforms. Campaign Zero creates a channel for directing diffuse online and offline action into legal and political change. Fault Lines, not just Big Tents. Cam Fenton, a 350.org campaigner who helped organise the March for Jobs, Justice and the Climate in Toronto, gives movement builders a plate tectonics metaphor when calling on us recognize the limits of a “Big Tent” approach to coalition building and instead focus on fault lines: “the points or issues where our struggles interact.” A recent call for climate activists to stand with refugees by 350’er Nicolò Wojewoda echoes Fenton’s points on movement-linking. We’re watching you (remotely). Brazil’s Ka’apor communities are using remote motion and temperature sensors, electronic tracking devices and highly accurate landscape maps to document illegal logging that’s destroying their native rainforests. Violent interactions with suspected loggers have left four Ka’apor leaders dead. Greenlighting green energy. “Social proof” (the idea that it’s easier for people to act when they see others doing it, too) is at heart of campaigner Chris Rose’s suggestion to put a green light on every solar panel, wind turbine, electric car or other renewable energy device. Could green lights change the color of climate talks in Paris?